Escaping Ornamentals…Is your garden spreading into the countryside? We all want our yards to look nice and many of us enjoy planting and caring for the plants that enhance our landscapes. Gardeners do important work, but can be unknowing spreaders of some dangerous non-native invasive species. From bush honeysuckle, barberry, burningbush and ornamental grasses, gardeners are often responsible for the spread of these invasive species into Ohio’s natural areas. Burningbush, or Euonymus alata is one of our most popular landscape shrubs. 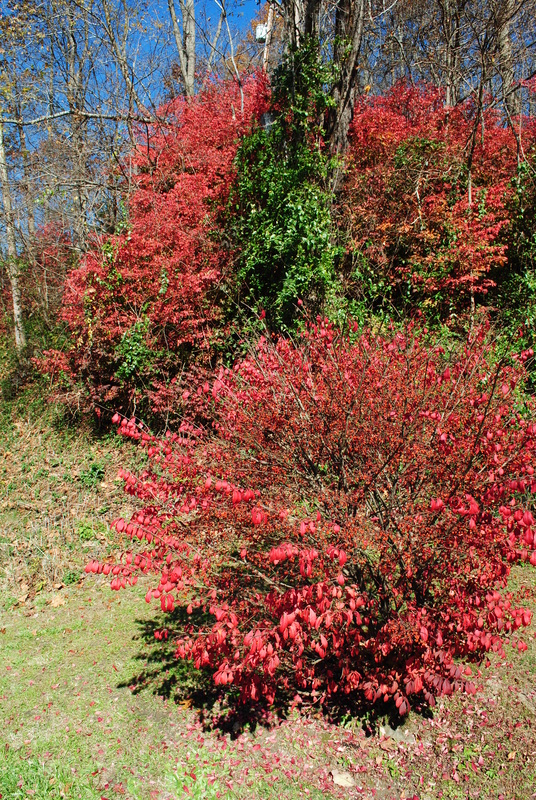 Burningbush is nicely shaped and attractive all year, but in the fall, it sparks to life with vibrant red foliage. This shrub’s color and because it seeds well and is easy to dig make it popular among gardeners. But burningbush has a dark side. It is an invasive species; a non-native species whose introduction causes economic, human, and/or environmental harm. In the case of burningbush, it spreads out beyond our yards into the surrounding woods displacing native shrubs and tree seedlings. Once established, burningbush grows so densely that it out-competes most native plants. With native plants diminished, the wildlife suffers and the ecosystem starts to unravel. Bush honeysuckles are prolific shrubs with fragrant spring flowers and red fall berries. They blanket roadsides, waste areas, and many wooded yards and parks. 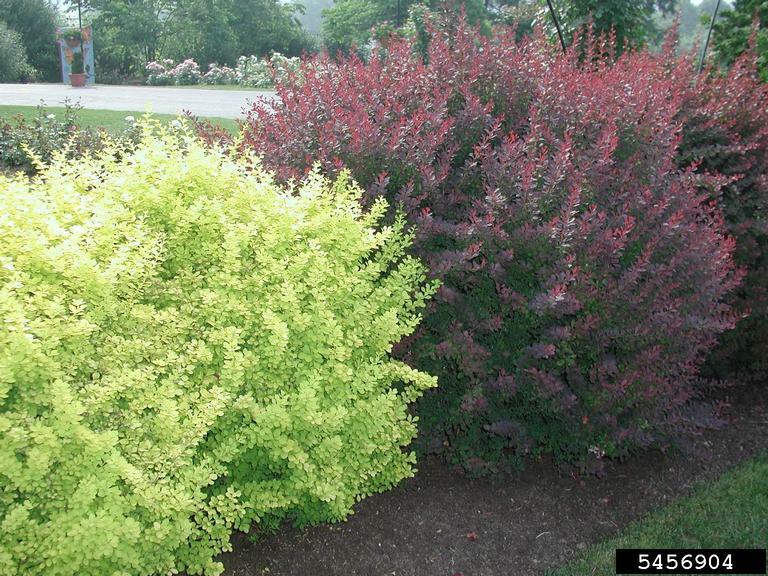 Japanese barberry is a small shrub with purplish foliage and small thorns, tending to grow in shady woodland sites. Autumn olive is a large shrub that can reach 15 feet and infiltrates woodland edges. Ornamental grasses create thick mats in waste areas and prairies and create fire hazards. Some might question the damage that invasive species cause. Green is good, right? But in nature not all plants are created equal. While these invasive species have berries that are eaten by wildlife, research shows that the nutrient content in honeysuckle and autumn olive fruit is inferior to native fruit like viburnum, Virginia creeper, sassafras, and spice bush. So if you have these invasive species in your garden, consider removing and replacing them with native plants. Several native shrubs have beautiful fall color, nice flowers, nutrient rich berries, and ecosystem benefits. These include Virginia sweetspire, smooth or fragrant sumac, nannyberry viburnum, arrowwood viburnum, blackhaw viburnum. The good news is that invasive species are controllable. They typically pull out of the ground easily after a rain. Big ones can be cut down and their stumps treated with an approved herbicide. The best way to keep them from returning is to fill the spot with desirable vegetation. As with all things, it is easier to deal with them when they are small and few and far between as opposed to waiting until you have an infestation. Posted on April 2, 2013, in Species profiles and tagged burning bush, invasive plant management, japanese barberry, nature, ohio, plants. Bookmark the permalink. Leave a comment.